"I recently stopped by a local hobby store, originally intending to only pick up some supplies. However, I looked around at some of the new products and decided to try a pack of 2005 Donruss Classics. I took a pack from a box that was about half full. 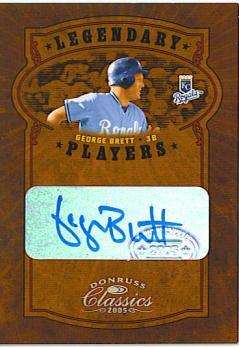 In that one and only pack that I bought, I had pulled my best card to date: a Legendary Players Platinum George Brett autograph numbered 1 of 1 (no Beckett value listed due to scarcity)! I couldn't believe my luck! It's the best pull I've ever had and is currently in my personal collection." "I am a 13-year-old collector from NY. About a year ago, I went into a local gift shop and saw some nice basketball packs. I bought *one* pack of 2002-03 Upper Deck MVP for $2.25. 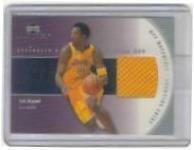 When I opened the pack, a Kobe Bryant game-used shooting shirt card (KB-S) was right in the middle (currently valued at $60 in the Beckett magazine). This is the card that got me into card collecting. For me, this was one of the most exciting days of collecting." "I recently bought a box of 2004 Leaf Certified Materials Baseball from Dave and Adam's Card World. After 4 packs, all I had to show was a Rickey Henderson GU /35 which got me really excited for the last pack. 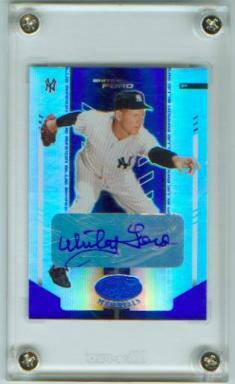 It contained a Mirror Blue Signatures card numbered to 25. When I turned it over, I saw the name Whitey Ford. Beckett value is currently $80." "I recently bought a hobby box of 2002 Donruss from a fellow collector on The Bench (www.teamsr.net) named Zac Weiner (Zlw1). After opening 6 packs with nothing more than a common card, I started to open lucky #7. Right when I opened it, I saw the /66 and Tom Seaver. It was at that time that I realized that this was no ordinary card. 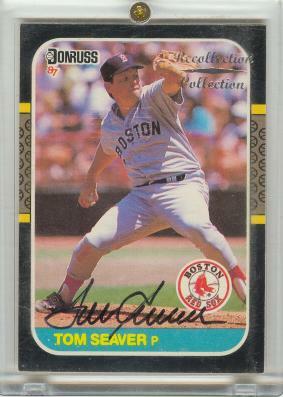 I flipped over the card and there it was - a 2001 Donruss Recollection Collection Tom Seaver Autograph /66 (no Beckett value listed due to scarcity). All and all, it was a great day for me." "I recently pulled a Hideki Matsui signature (2004 Upper Deck Signature Stars Blue Ink HM - limited to 324) out of a 2004 Upper Deck box. I paid $65 for the box and the card is worth $250 (Issue #229 Beckett Baseball Card Monthly Online Price Guide)." "My wife recently bought a wax box of 1996 Crown Jewels Elite. When we started to open packs, she suddenly stopped and was just staring at the card in her hand. I didn't think much of it because I thought she might just like the card, but then she showed it to me and I got a good look at it. It was one of the Earnhardt 7 Gems Treasure Chest cards that books for about $100 (March 2002 Beckett Racing & Motorsports Marketplace). It is things like this that make collecting fun for my whole family. Hope you enjoyed the story and share card collecting with your families also." "I'm one of those collectors who does not want to spend a lot of money on my cards. So, about once a week, I go to the local Toys "R" Us and pick up a box of baseball cards. For $10, the boxes come with 8 assorted packs of cards, ranging from 1990-2001. I usually get maybe one or two cards worth $10-$20 in the box. That is what I expected the last time I bought one of these boxes. After opening 7 packs with not much luck, I opened the last pack - a 2001 Topps Series 2. To my surprise, I pulled a Roberto Clemente game-used bat card (2001 Topps Original #1) currently booking for around $250 (April 2002 Beckett Baseball Card Monthly). This is by far the most valuable card in my whole collection."